Now you know the real thing..
Ravioli is a type of dumpling that has a filling between two layers of pasta dough. The filling can be either meat or cheese or a combination of the two. Making the pasta takes time and patience but the reward is a meal fit for your family and will make your children want more. Making the dough is an art form. It helps if you use a pasta maker as you can get a better consistency when making the dough. The only problem with the pasta machine though is that the dough has to be made in small batches which end up about the size of the pasta machine. Your dough may not be the correct consistency at first but it is well worth the attempt once you have perfected it without a pasta machine. Homemade dough is so unlike any store brands, tastier and lighter. 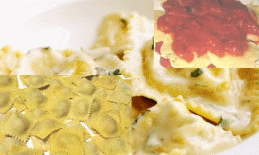 Now we have all seen the standard square type Ravioli, but you can make them in any shape. If you dont have a cookie cutter assortment, folding over the dough and sealing on one side is another way to make them. In fact, it might be easier to do at first than to align a top and a bottom without a cutter. Cookie cutters will be needed should you want to make special designs. Some use a round shape while others will use a heart shape for special occaisions. But you can use just about any type and size. Just remember small sizes are hard to fill and seal. Have fun! Don't' get frustrated. In a large mixing bowl pour flour and make a well in the center of the flour, add eggs and small amounts of water while mixing with hands to make a STIFF dough. Cut into two parts. Roll out first part with a small rolling pin on a well floured board to desired thickness. Keep in mind that you will need a top and bottom for these pasta treats. The thickness should be able to hold the filling without breaking apart. Once the dough is rolled onto the board take two tablespoons of the filling and place on the bottom layer of dough approximately two inches apart. Roll 2nd part of the dough to the same thickness and cover the entire layer of filled dough. You will need a special cutter or cookie press to make the individual item pressing each filled area and making sure the ends are sealed. Putting the filling on the dough neatly will require a special filling bag and tip. This is by far the easiest way to get the filling onto the pasta. Use your cake decorating skills when using the filler bags and tips. Another variation would be to roll the dough into three equal parts, fill as directed and bring one side of the dough over the filled area and press the other three sides. They must be cooked in boiling water until dough is tender but not mushy. So it will be important to make sure the dough is sealed all around. In a 9 x 13 baking dish, cover bottom with tomato sauce and place the cooked dough into the baking dish. layering the pasta and sauce until all are used. Bake in a 350 degree oven until sauce is bubbling. May be topped with shredded mozarella cheese. Serve Hot! Make large quantities and freeze half for a second meal or for that special occasion. When boiling, bring the water to a rolling boil first then turn the heat down so that the water is boiling but not a hard rolling boil as the pasta dough may separate and all you will have is pieces of pasta and cheese filling. Get a special chefs tool that you can roll on the dough to make consistently pressed Ravioli. If you are pressed for time, the market will usually have prepared items for you to choose. Some are in the frozen food section and some are in the cooler sections where you can find meats, bacon and sausages. Fried Ravioli is a real treat. Using an Alfredo sauce is an excellent way to prepare a special side dish alternative with steak medallions. Return to Easy Everyday Cooking Recipes.